Turlough O'Carolan, that well known Irish Harper-Composer, was born in the year 1670 near Nobber, County Meath, where his father was a blacksmith. In 1684, when he was 14 years of age, his family moved to Ballyfarnon, County Roscommon, where John Carolan - Turlough's father - was employed by the McDermott-Roe family who lived at Alderford, Ballyfarnon. Mrs. McDermott-Roe took an interest in him and had him educated. When Turlough was 18 years of age he contracted small pox, a disease which was usually fatal at the time. His life was spared but he was left permanently blind. Turlough's blindness, in a way, was a blessing because it awakened in him a hidden gift for music. It was then that his patron, Ms Mary McDermott-Roe, saw to it that he was trained in the Irish Harp. She had him apprenticed to a harper who was a relation of hers. She maintained him during his three years of study and when he reached 21 years of age provided him with a harp, a horse, a guide and sufficient money to begin his professional career. He started on his way as an Itinerant Harper. At first he was not considered to be a great musician, mainly because he was an adult when he started studying, and when it was suggested to him that he try his hand at composing he did so and composed Sheemore and Sheebeg. It was then his fame spread throughout Ireland and his career took off. The way Turlough made a living was to travel from big house to big house and from castle to castle, entertaining the households and the friends of some of the most famous and wealthy people in Ireland at the time. Often as a special favour he would write a tune in honour of the man of the house or his wife or daughter. He called these tunes "Planxties". He was very successful and people would delay weddings and funerals until he could be present to play the appropriate tune. In 1720 , Turlough Carolan married Mary Maguire. He was then 50 years of age. Their first family home was a cottage n a parcel of land near Mohill, Co Leitrim, where they settled. They had seven children, six daughters and a son. In 1733 his wife Mary died. Turlough Carolan was one of the last Irish Harpers who composed and a significant number of his works survive in single line melody. He started playing the harp when he was 18 years of age and became very skillful at it, but his .fame developed from his gift for composition and verse. When Turlough Carolan was a very young man, before his blindness, he met and fell in love with a young woman named Bridget Cruise. Bridget was part of a noble family and Turlough's family was of skilled labourers, so a match could never be made. And even though he went on to live a very successful life, he never forgot Bridget and wrote three "Planxties" in her honour. He met her again near the end of his life when he was on his way to a Religious Retreat in County Donegal. In the year 1738, feeling ill, he returned to the home6(his patron, Ms Mary McDermott-Roe. It is said that his 'final composition was to her Butler who brought him his last drink. He died on the 25th March, 1738, aged 68 years. He was buried with much ceremony in the cemetery at Kilronan. A plaque in Saint Patrick's Cathedral, Dublin, honours him as "The last of the Irish Bards", the man who brought to a close the centuries-old tradition of the Wandering Poet/Minstrel. Carolan's wake is said to have lasted for four days. Harpers from over a wide area attended the wake and played their harps continuously. His funeral was also impressive with a large number of Priests taking part in the ceremony. 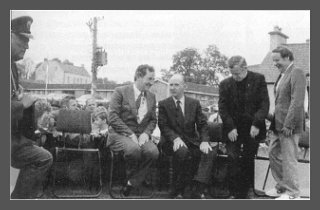 In the early 1980's a Committee, known as the Carolan Memorial Committee, was formed to raise funds with a view to commemorating Mohill's most famous traditional musician and composer. They decided to have a suitable memorial put in place and commissioned the well-known sculptor, Oisin Kelly, to carry out the work. 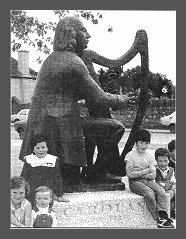 In 1986 the bronze monument depicting Turlough Carolan playing his harp, was erected on a plinth at the Market Square, Mohill, and on 10th August, 1986, His Excellency, Doctor Patrick Hillery, President of Ireland, visited the town and in the presence of a large gathering of people unveiled the memorial. It is a fitting tribute to the memory of Turlough Carolan and the time he spent with his wife and family living in the Mohill area.